This Stage 3 program is designed to allow students the opportunity to observe the fascinating creatures of the rock platform. This program can be delivered at Bournda or at a selected rocky shore location close to your school. Students examine the structural features and adaptations that different species possess that allow them to survive in an intertidal environment. The students experience firsthand the physical conditions of the site and learn how this impacts on the growth and survival of the tide pool inhabitants. Additional activities focusing on animal adaptations are available to compliment the learning in this program. What are some types of structural features and adaptations that help different species to survive? How do the physical conditions of an environment impact on the growth, survival, behaviour and adaptations of the species that live there? 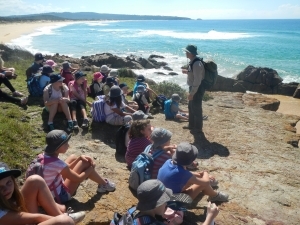 Students work in groups and employ scientific methods to survey and collect living and non-living plants and animals from the rock pools and along the tide line. Bournda staff move between the different groups helping students collect their specimens, monitoring safety aspects and pointing out interesting species and phenomena. On completion of the collection students assemble together on the beach to discover what interesting species have been found by other students. Students discuss how the physical conditions at the rocky shore (waves, temperature tidal movement and water chemistry) impact on the growth, survival, behaviour and adaptations of the species that live there. Bournda staff help students to complete their adaptations data collection sheets, identify species and explain interesting structural features that each organism employs to survive in the rocky shore environment. All specimens are then released unharmed. Students learn what an adaptation is by constructing animals from different habitats. They are first introduced to the concept that animals are specifically adapted to the habitat they live in. Three environments are then explored; one arctic, one desert and one aquatic. Once the role-play activity has been completed for each environment, the students will have an understanding of adaptations and how they relate to the environments in which the organism lives. Bird beaks is a program where students examine beaks of a variety of different birds and discuss the variation and features of each specimen. Students need to try and determine what type of diet each bird would eat based on the structural features of the beak. 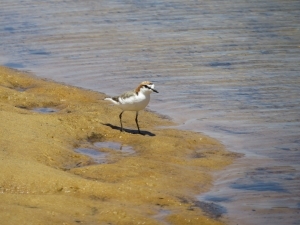 The different types of birds are then discussed and ID photos examined. investigates by posing questions, including testable questions, making predictions and gathering data to draw evidence-based conclusions and develop explanations. Living things have structural features and adaptations that help them to survive in their environment.